The curtain rises and the lights goes off: let the show begin! Welcome to Teatro Piccolo, a little theater for kids to invent their own stories! This cardboard decor can be fold and unfold as much as you want to form a very coquettish little theater. On one side, the spectators wait impatiently on the balcony the beginning of the performance. On the other side, the theater has a view on a lovely garden. Very light, you can fold and keep very easily the decor, so that kids can take it to play everywhere. Kids can choose and change the landscape of their story. A fortified castle, an old harbor, a sumptuous royal bedroom or on a balcony under a starry sky… The removable decors sheets will inspire beautiful stories. What do we play tonight, Moliere or Shakespeare? In this little theatre, you can invent your own stories like great theatre authors, whose plays are named in many elements of the game. The stage is set? What about the actors? They are getting prepared in the wings… Teatro Piccolo includes 11 funny cardboard characters that can stand perfectly following a simple folding. Their costumes and expressions are inspired by characters from classic theatre plays. Here are a few of them; can you recognize some? Something is telling me that those two lovers won’t have a happy ending story… with those characters, kids can reinvent the Romeo and Juliet play by Shakespeare. Shrewd and malicious valet, Scapin is an important theatre character to which Moliere dedicated a play, “Les Fourberies de Scapin”. With Teatro Piccolo, live great game experience about theatre. 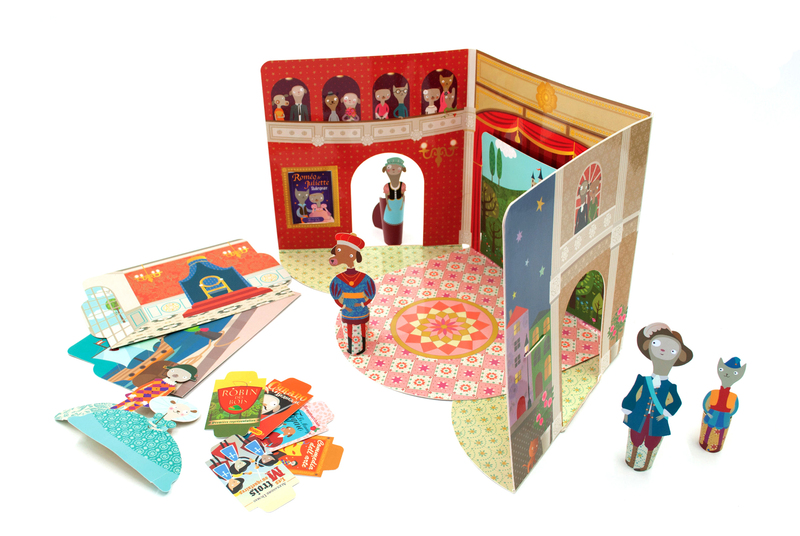 With this decor and characters, grown-ups will transmit to kids their interest for theatre and beautiful plays. Let your imagination transports you and invent your own stories!